Here’s a quick overview of Surface Pro 2 features. 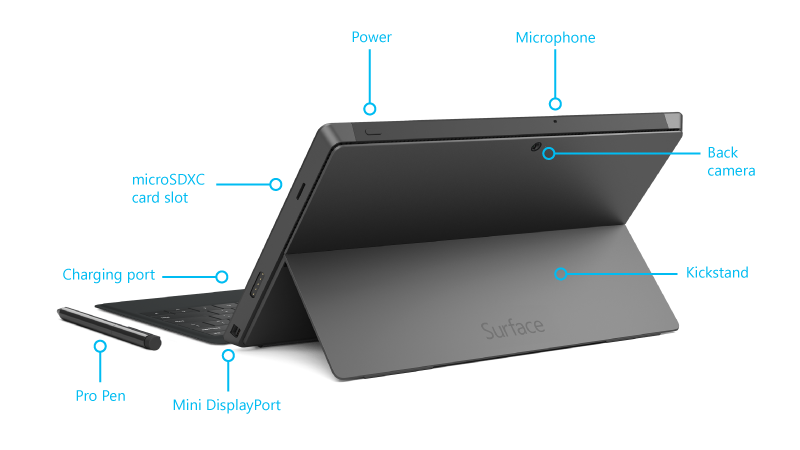 If you want to learn more about Surface Pro, download the User Guide for your Surface. The 10.6” ClearType Full HD display, with its 16:9 aspect ratio and 1080p resolution (1920x1080 pixels), is great for watching HD movies, browsing the web, and using Office apps (sold separately). You can use your fingers to select, zoom, or move things around on the screen. 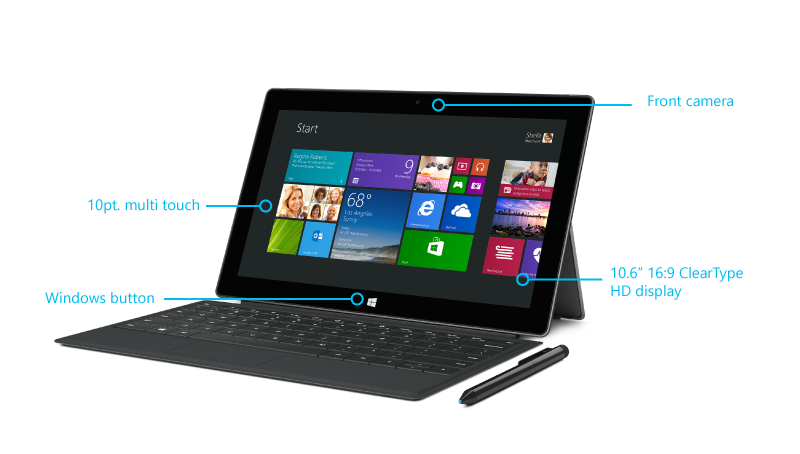 For more info, see Surface touchscreen andTouch: tap, swipe, and beyond. And touch isn’t the only option. Choose from unique keyboards that double as a protective cover. This way you’ll always have a keyboard with you (sold separately). See Accessories for info on the full range of accessories available for your Surface. Take notes, draw, and mark up documents using the digital pen. See Using the Pro Pen. Surface supports standard Wi-Fi protocols (802.11a/b/g/n) and Bluetooth® 4.0. This means that you can connect to a wireless network and use Bluetooth devices such as mice, printers, and headsets. Two cameras and a microphone make it easy to make phone calls and record videos using your Surface. The cameras record video in 720p, with a 16:9 aspect ratio (widescreen). Flip out the dual-angle kickstand when you want to be productive, or when you want to kick back and have some fun. One position is ideal for typing at a desk, and another for typing on your lap. Listen to music, conference calls, or audio books using apps from the Windows Store or Internet Explorer. For example, you can use the Music app to play music and the Video app to watch TV shows, movies, and videos. See Surface sound, volume, and audio accessories for more info. Connect USB accessories—like a mouse, a printer, a 4G USB dongle, or an Ethernet adapter. For info about this, see Connect a USB mouse, printer, and more. Use the microSD card slot (along the right edge) for extra storage or transferring files. For more info, see Surface storage options. Share what’s on your Surface by connecting it to an HDTV, monitor, or projector (video adapters sold separately). For more info, see Connect Surface Pro to a TV, monitor, or projector. Attach the power supply to the charging port when your battery is low. For more info, see Surface Pro battery and power. Windows 8.1 Pro has everything in Windows 8 plus BitLocker data protection, domain join, and Remote Desktop Connection hosting. Surface Pro 2 comes with many built-in apps—check out the tiles for them on your Start screen. And you can install more apps from the Windows Store . You can also run programs you’ve been using with earlier versions of Windows. For more info, see Install and uninstall apps on Surface Pro. 4th Gen Intel® Core™ i5 Processor, with Intel HD Graphics 4400 with 8 GB RAM (Dual-channel LPDDR3). 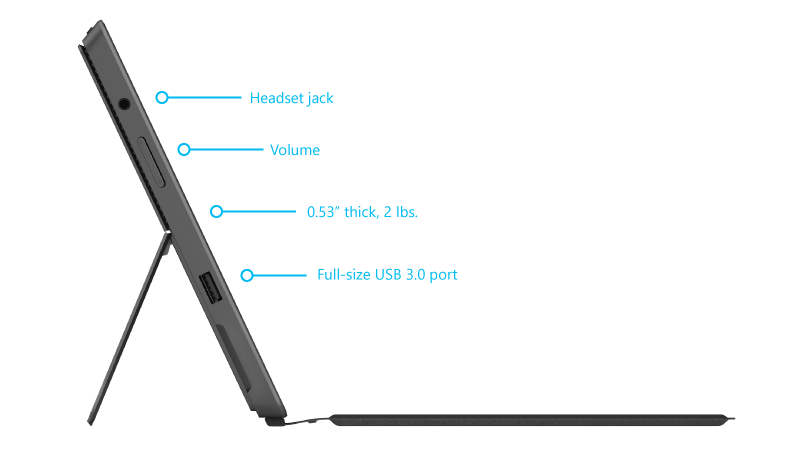 In addition to the internal storage included with Surface Pro 2, there are some additional storage options. For info about this, see Surface storage options. Surface has four sensors (an ambient light sensor, an accelerometer, gyroscope, and compass) that apps can use to do cool things.